Emergency Intercom Help Points provide assistance at the push of a button, allowing immediate contact with the security or information desk from specific locations within your site. These systems can be used anywhere people might need access to emergency help or information, including university campuses, airports, and town centres. If an accident or incident occurs on site, it is comforting for both employees and the general public to know there is quick access to emergency help when it is needed. Pulse & AlphaCom Emergency Intercom Help Points can also be programmed to trigger CCTV cameras at the corresponding help point when a button is pushed. This allows security personnel to view what is happening at the scene, so they can tailor their response appropriately. 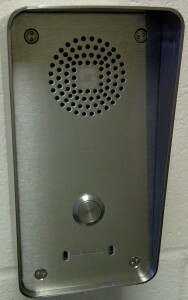 These Intercom Help Points can also be used as communication and information points at shopping centres, public attractions and places of interest. They allow the user to easily find out directions, locations and more, without the inconvenience of having to walk great distances to find the tourist information office. Utilizing two-way hands-free technology, STENTOFON Convention and IP Substations allow users to speak freely with security or informational personnel, without having to hold down a button. When activated in emergencies, the Help Point can be programmed to use high power lamp and strobe flashes to deter criminals and alert help to the scene. You’ll benefit from connection to external IP video camera and superb, wideband audio quality allowing security staff to see and hear more clearly. There is also a tamper alarm which provides enhances system security. Alongside this, the system boasts remote software upgrades, configuration and monitoring – meaning your system can be maintained and kept in line with technology, without physical visits. These systems are ideal for locations in which there large volumes of visitors, who may not know where to go to get help.